What comes to mind when you think of dance studios? Chances are the picture you have in your mind is not entirely accurate. Here are some fun facts about learning to dance in Suffolk County. Many people are reluctant to sign up for dance classes because they think they need a partner. 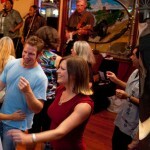 In fact, dancing is a great way for singles to meet new people, and you do not have to bring a partner to join a class. In fact, dancing is a great activity for people who may have difficulty in social situations. You can interact with new people without having to worry about having awkward conversations or making small talk. Many students gain confidence through learning to dance, and find it easier to handle social situations. In a Suffolk County dance class, you can meet new people in your hometown in a no-pressure, fun setting. In our Suffolk County dance studio, we teach the traditional ballroom dances like the Foxtrot, Waltz, and Quickstep, but also offer classes and private lessons in country and western dancing, hustle, and swing dancing. You will find a type of dance that suits whatever type of music you prefer. Whether you like to don your cowboy boots and head to the local country bar, or plan a grand evening at the Rainbow Room, we can help you look like a pro! This is a common fear that keeps many people from trying dance classes. If you are worried about keeping up in a group setting, consider taking a few private lessons before you join a class. The expert instructors at our spacious Long Island dance studio can teach you the basics, so you will feel comfortable if you want to join a class. Dancing is great exercise for anyone no matter your age or level of fitness. You can get a great workout learning the faster dances like the cha-cha, Swing, and the quickstep, but even the slower waltz and tango will get you moving. If you are looking for an aerobic, solo fitness workout, check out our Zumba classes. You may be ready to create a YouTube-worthy first dance video for your wedding, or simply hoping to create a romantic memory with your new spouse. Some couples find the prospect of dancing in front of their families and friends intimidating and stressful. Planning a wedding is stressful enough – with a few lessons, you will feel much more comfortable, and your first dance can actually be enjoyable. Who knows? You may enjoy your new skill so much that you want to continue after the wedding. Our Suffolk County dance instructors can prepare you for other special occasions also – bar mitzvahs, Sweet 16 parties, family weddings – we can teach you some basic steps, or prepare something for a piece of music you have picked out. People of all ages can enjoy the social and physical benefits of dancing. At The Ballroom of Huntington, we would love to help you unleash you inner Fred Astaire! Call us at (631) 385-7271 or come by and see us!